Every company deserves the best IT care they can get from the best IT Support to be found in New Orleans. In Urbanland Land Magazine, Leigh M. Ferguson, director of economic development at the Downtown Development District of New Orleans, said that although tourism in New Orleans remains strong, New Orleans has also witnessed significant changes in the technology field and it is now anticipating growth around the medical and research sectors, especially with the opening of two new medical centers downtown. These are the University Medical Center and the Veterans Affairs Regional Medical Center. “Our technology sector is growing with recent announcements such as that of Virginia-based DXC Technology, which describes itself as an ‘end-to-end IT services company,’ opening a New Orleans office this year that will eventually employ 2,000 people,” Ms. Leigh M. Ferguson said. This presents an opportunity for us at thinkIT Solutions to support the growth trends being experienced in our home town. 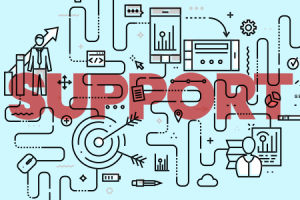 The healthcare sector has accepted third party IT Support from within the New Orleans IT community and is working together with IT companies to assist them on each step in their IT systems maintenance and support. We are proud to count healthcare businesses among our client base. thinkIT Solutions make sure that every solution that our clients receive is the best fit for their needs. Our plans and strategies are carefully thought out to meet expectations and regulatory requirements. We sincerely listen to every concern and set goals that our are in alignment with what our clients aim to achieve. The Health Insurance Portability and Accountability Act of 1996 (HIPAA) required the Secretary of the U.S. Department of Health and Human Services (HHS) to develop regulations protecting the privacy and security of certain health information. thinkIT Solutions understands the needs of medical providers and the need to abide by HIPAA to insure patient’s rights are respected and confidential data stays secure. Manual record keeping on paper creates a lot of waste, and electronic record keeping is certainly a eco-friendlier way of going about things. Rather than using paper, you have electronic records that can be accessed anytime and with ease. You wouldn’t have to go about searching for the right file belonging to a patient and that information can be shared selectively by all providers offering service to a patient, allowing for less mistakes and better coordination between providers. thinkIT Solutions provides efficient virus protection, spam management, password resets, round-the-clock monitoring of your network and much more. The client is our priority. This ensures prevention of any IT problems that could lead to worse situations. The healthcare sector can rest assured we provide the protection that every healthcare provider needs. thinkIT Solutions can adjust depending on what the healthcare provider needs. We have different pricing models from which healthcare providers can select. To begin, we need to diagnose your system and see what best fits your endpoint environment. We want the best for you because your success is our success. What’s your number one priority? Your patients and employees? Both need access to advanced technology to improve patient outcomes. To deliver the best patient care, you need secure, timely and accurate communication — and that’s determined by your technology. Since 2001, we’ve worked hard to earn the trust of our clients by delivering the high-quality IT services they need to meet the demand of their industry. Our team of professionals strives to find long-term, strategic solutions to solve your biggest challenges. thinkIT delivers healthcare IT solutions to remedy any issues you have with uptime and performance, as well as keep you compliant with HIPAA regulations. Whether you need more server space, data security, managed backup recovery or the latest technology, we’re here to help. Are you interested to learn what we can do for you? Visit our website for more details and to contact us.